Recently, the 20th IOCCG Committee meeting took place at the the Centre National d’Etudes Spatiales (CNES) Headquarters in Paris (3-5 March 2015). The meeting was attended by scientific members from around the world as well as representatives from major international space agencies (CNES, CSA, ESA, EUMETSAT, INPE/CONAE, ISRO, JAXA, KIOST, NASA, NOAA and SOA) who briefed the committee on current and future plans for ocean colour sensors from their respective agencies (some participated remotely). The Committee reviewed the status of the five current IOCCG working groups which were all making good progress. 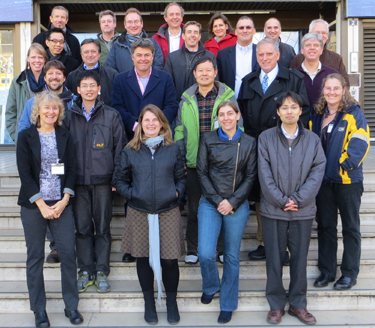 The report from the WG on “Ocean Colour Remote Sensing in Polar Seas” should be ready for printing later this year. The Committee also recommended the formation of a new WG on “Ocean Colour Applications for Biogeochemical, Ecosystem and Climate Modeling”, and is considering formation of a WG on “Ocean Colour Remote Sensing of Benthic Ecosystems” as well as a re-scoped “Coastal Water Algorithm” working group. Details will follow. New IOCCG Committee members (from left to right) Xianqiang He, Bryan Franz, Hubert Loisel, Emmanuel Boss and Philippe Escudier. Several members rotated off the committee including Gene Feldman (NASA GSFC), Zhihua Mao (SOA, China) and Juliette Lambin (CNES, France), who were thanked for their outstanding commitment and important contributions over the past few years. Four new IOCCG Scientific Committee members were nominated for 2015 including Xianqiang He (SOA, China), Bryan Franz (NASA GSFC), Hubert Loisel (Univ. du Littoral, France) and Emmanuel Boss (Univ. Maine, USA). Philippe Escudier was appointed as the new CNES representative on the IOCCG Executive Committee. IOCCG extends a warm welcome to all the new Committee members. The full minutes of the meeting are available here. The second International Ocean Colour Science (IOCS) meeting will take place in San Francisco from 15-18 June 2015. Registration numbers are fast reaching capacity – the deadline for registration and abstract submission is 15 May 2015. The scientific program will include invited keynote speakers, presentations from various space agencies outlining the status of current and planned missions, ten parallel breakout sessions related to the overarching theme of the IOCS meeting, “Applications of Ocean Colour from Climate to Water Quality”, the NASA Ocean Color Science Team (OCRT) meeting, a SeaDAS/BEAM workshop, poster presentations for participants to present their own research, and a new event entitled “Visions and Hallucinations” (scientists are welcome to present highly innovative and provocative concepts in the field of ocean colour radiometry). 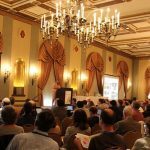 Side events include three public lectures at the Exploratorium and a West Coast workshop at the Gulf of the Farallones National Marine Sanctuary. Further details on all these events can be found on the meeting website: iocs.ioccg.org/. The IOCCG working group (WG) on “Earth Observations in Support of Global Water Quality Monitoring” held a short meeting in conjunction with the Group on Earth Observation (GEO) Water Quality Summit in Geneva (20-22 April 2015) to discuss progress on the Water Quality report. Ten WG members reviewed the draft chapters and addressed various issues. The WG plans to meet again at the upcoming IOCS meeting in June 2015. The GEO summit defined specific requirements of the water quality observing system components and developed a plan to establish a harmonized multi-scale global water quality monitoring service. The service will provide a baseline set of consistent products for multiple users, and a framework for the development of further products, indicators and knowledge. A GEO water quality community of practice will be developed to implement the defined strategy, in synergy with other GEO initiatives (e.g., Blue Planet, GEOBON, GEO Health). European Space Agency (ESA), in the context of the Scientific Exploitation of Operational Missions (SEOM) element, will host the “Sentinel-3 for Science Workshop”(Venice, Italy, 2-5 June 2015) to prepare for scientific exploitation of the Sentinel-3 mission. The workshop will provide a forum to present the Sentinel-3 mission status, algorithms and products and will allow ESA PI’s and scientists to present first results exploiting Sentinel-3 type data using previous ESA and Third Party Missions. It will also provide a forum for international exchange on ocean, atmosphere, land, inland water and cryosphere applications and allow scientists to formulate community recommendations. The outcome of the workshop will help to further shape the next generation of R&D activities in the frame of ESA Earth Observation Programme. For further information see: http://seom.esa.int/S3forScience2015/. Several new employment positions have been posted on the IOCCG website including two Postdoctoral positions in ocean colour (USA) and several EUMETSAT positions to support the Copernicus Program and the upcoming Sentinel-3 mission (Europe). For further details see: www.ioccg.org/employment.html. The NASA Ocean Biology Processing Group (OBPG) is currently undergoing a multi-mission ocean colour and SST reprocessing effort of all global missions to ensure continuity of the long term data record. OCTS and VIIRS reprocessings have been completed (after the initial R2014.0 reprocessing of VIIRS further refinements have been incorporated into reprocessing R2014.0.1). Reprocessing of MODIS-Aqua and Terra, SeaWiFS and CZCS is in progress (see oceancolor.gsfc.nasa.gov/cms/reprocessing/OCReproc20140.html for further details). MODIS-Aqua has shown increased temporal variability in blue (412, 443) water-leaving reflectance trends since 2011, and a shift in all radiometry in 2014 as a result of calibration error. OBPG and the MODIS Calibration Support Team are working to resolve these issues, but it has proven increasingly challenging due to the age of the instrument (see Bryan Franz’s presentation for further details). The Hyperspectral Imager for the Coastal Ocean (HICO) mission on the International Space Station (ISS) was officially terminated in late December following a severe radiation hit during a solar storm. HICO was developed by The Naval Research Laboratory (NRL) as an Innovative Naval Prototype. During its 5 years of operation on the ISS, HICO exceeded all its objectives and collected approximately 10,000 hyperspectral scenes of the Earth. Most of the HICO scenes taken over sites worldwide are now available to researchers through http://oceancolor.gsfc.nasa.gov/ and http://hico.coas.oregonstate.edu. Plans are underway for NASA’s new Pre-Aerosol Clouds and ocean Ecosystem (PACE) mission, tentatively scheduled to launch in 2022. The primary objective of the mission is to understand and quantify global ocean biogeochemical cycling and ecosystem function in response to environmental variability and a changing climate. The secondary objective of the mission is to understanding how aerosols and clouds affect Earth’s climate. PACE will be managed by NASA’s Goddard Space Flight Center in Greenbelt, Maryland. For further information see dsm.gsfc.nasa.gov/PACE.html. 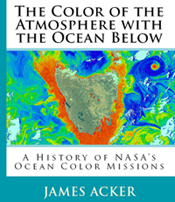 A new book entitled “The Color of the Atmosphere with the Ocean Below” is a comprehensive history of NASA’s “ocean color” satellite missions. Written by James Acker with funding from the NASA Science and History Divisions, this book covers the science, technology, and diverse scientific personalities that allowed NASA to successfully extract measurements of light from the ocean surface using satellite instruments. These measurements allowed the observation and determination of the complex patterns of biological activity in the global oceans, which are directly related to mankind’s understanding and utilization of the oceans. This research has also added further knowledge of the role of the oceans in local and regional ecosystems, as well as their role in the rapidly changing global climate system. Included is a section covering the founding of the IOCCG. The history is extensively footnoted and referenced, providing unique documentation of this successful sector of NASA’s Earth science missions. It also covers the broad range of oceanographic research to which these vital data have been applied, and explains many scientific aspects. The history was substantially augmented by individual and group interviews of scientists and engineers involved with the three primary NASA ocean color missions. These interviews (and supporting documentation) describe the diligent efforts and collaborations of oceanographers, physicists, satellite and sensor technicians, computer programmers, government agencies, and private companies to surmount remarkable challenges both at sea and in space to make this critical oceanographic data accurate and useful. Augmented with numerous anecdotal insights into the missions – what made them work, and the many different pitfalls and surprises that frequently imperiled their eventual success – The Color of the Atmosphere with the Ocean Below provides a detailed and complete history of NASA’s leading contribution to the observations of ocean color from space, and will both inform and entertain readers interested in science, oceanography, and remote sensing of the Earth. For instructions on how to purchase a copy of the book, please contact James Acker (james.g.acker@nasa.gov), or order directly through Amazon.com (available mid-May 2015). If you are planning to attend the International Ocean Colour Science (IOCS) meeting in San Francisco, don’t buy a copy of the book right away. Meeting attendees may be able to get the book at a substantially reduced rate. Watch for an announcement closer to the meeting date. Several new publications have been added to the IOCCG Recent References list including a paper by Frouin and Pelletier (2015) who examined the ocean colour inverse problem, i.e., the retrieval of marine reflectance from top-of-atmosphere (TOA) reflectance, in a Bayesian context. The solution is expressed as a probability distribution that measures the likelihood of encountering specific values of the marine reflectance given the observed TOA reflectance. This conditional distribution, the posterior distribution, allows the construction of reliable multi-dimensional confidence domains of the retrieved marine reflectance. The expectation and covariance of the posterior distribution are computed, which gives for each pixel an estimate of the marine reflectance and a measure of its uncertainty. Situations for which forward model and observation are incompatible are also identified. The theoretical concepts and inverse models are applied to actual SeaWiFS imagery, and comparisons are made with estimates from the SeaDAS standard atmospheric correction algorithm and in situ measurements. Estimated water reflectance by the Bayesian methodology for SeaWiFS imagery of the ocean off South Africa. Vanhellemont and Ruddick (2015) present the use of the high quality SWIR bands of the Operational Land Imager (OLI) on Landsat to extend their existing turbid water atmospheric correction to extremely turbid waters. The paper describes in detail the default atmospheric correction used in their Landsat-8 processor (ACOLITE), and shows a novel application for detecting black sediments relocated by dredging operations. The authors also have a new ACOLITE forum online (odnature.naturalsciences.be/remsem/acolite-forum/) where the latest version of their ACOLITE processor is freely available for download.